Progesterone is a hormone that is naturally produced by the female body that is particularly important to the fertilization process. In particular, it ensures that a fertilized egg stays implanted in the uterus, leading to a healthy pregnancy. This hormone also regulates menstrual cycles and menopause. If you are struggling to get pregnant or you are a woman struggling with other hormonal issues like PMS, then finding the best natural progesterone cream can make a big difference in your life. However, finding the best progesterone cream can be difficult.. It is important to look for a progesterone cream that is natural, because it will cause fewer side effects than a synthetic hormone. Another big benefit of using progesterone cream is that it can manage PMS symptoms in women that have low progesterone production. If your body does not produce enough progesterone, you will have no hormones to counteract the effects of estrogen, which is a dominant female hormone. Since progesterone is a hormone that can really affect your overall health, it is important to be very careful when using a progesterone cream, even if it is natural (versus the prescription synthetic progesterone creams, which should never be used without the guidance of a doctor). When using progesterone cream, you will likely notice that symptoms like hot flashes, headaches, and water retention are exacerbated for a month or two. This is because your body is still getting used to this new balance of hormones, which means that it will overcompensate for the added amount of progesterone by producing more estrogen. However, this is totally normal, and you should continue using your progesterone cream because these symptoms will subside and then you will feel better. For best results, you should apply progesterone cream to areas of your body where it can be absorbed into the blood stream quickly. These places will have many capillaries close to the skin. Avoid areas like your stomach, as the fat in that area will absorb the progesterone and prevent it from moving through the bloodstream and having the intended effects. There will likely be a recommended dosage that you should follow with your progesterone cream. This is very important, because the progesterone will only stay in your bloodstream for about 12 hours no matter how much you apply. Therefore, if you apply a larger amount, it won't last longer, and you'll still have a half day where your hormones aren't balanced. As an added bonus, using progesterone cream right before bed actually helps some people sleep better. Adding hormones to your system that you don't need can cause serious health problems, so it is very important to confirm that you have low progesterone before taking progesterone cream. so all you need to do is get tested by your doctor to confirm before you start using the cream. Many women use progesterone cream to increase their chances of getting pregnant. If you choose to do this, be sure to continue using the cream unless you know definitively that you are not pregnant. If you stop using progesterone cream while you are pregnant, the drop in hormones could cause a miscarriage. If you decide that it is time to stop taking progesterone cream, be very careful with how you wean yourself off of it. Don't stop using it cold turkey, as this can cause very serious hormonal imbalances that you will then need to correct. Instead, slowly wean yourself off by taking smaller and smaller doses each time. What is the best progesterone cream? Once you've decided that you need to use progesterone cream, it can be very difficult to find the right one for your needs. There are plenty of options out there on the market, but you'll want to make sure that you choose one that has been known to work quickly and effectively, without any side effects. We prefer natural progesterone creams, because they aren’t as difficult for your body to process as a synthetic progesterone cream. This progesterone cream is very effective for those who are suffering from the symptoms of menopause, low progesterone, or are trying to get pregnant. It is very affordable and comes in a convenient size of four ounces. It also has a pump, so you won't end up wasting any cream. Unlike many other products, it has no parabens, is all natural, and is not tested on animals. 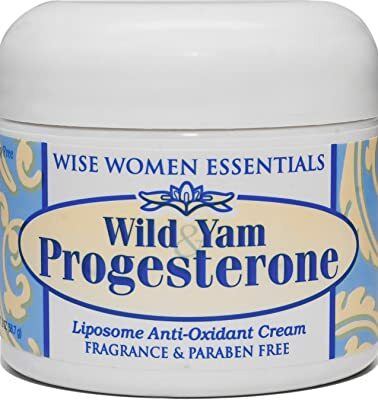 The progesterone in this product comes from wild yams, which is a natural source. Many people find they need to use the brand's estriol booster as well to see results. 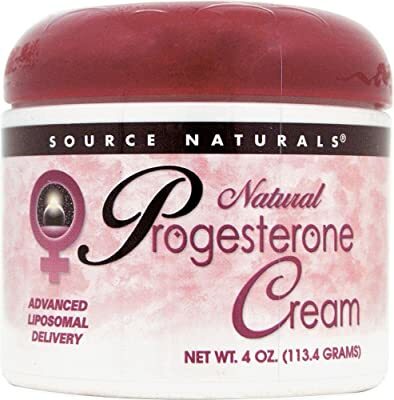 This natural progesterone cream contains a high concentration of the hormone made from soy. It contains a variety of healthful ingredients, such as aloe vera, vitamin E, jojoba oil, and more, all of which are very helpful for keeping your skin and body healthy. It comes in both tubes and jars, depending on your preference, and the brand also sells progesterone in much larger tubs. Contains tons of natural soothing ingredients. This natural formula is made with wild yam extract, which adds progesterone to your system naturally. It is made in the United States with a variety of all natural ingredients that have anti-oxidant properties. It contains no fragrances, parabens, or GMOs, so it is very healthful for your body. It works well for both premenstrual syndrome and menopause by balancing your hormones. So it is best for those who are willing to really invest in their health. The downside is that this product can take a cycle or two to kick in because the blend is completely natural. However, once it starts working, it is very effective for a variety of symptoms and can really help you sleep through the night if that is something that you struggle with. This clinically tested cream is completely natural and is very effective for reducing hot flashes, night sweats, and other issues associated with menopause. It comes in a convenient tube size, and does not contain parabens, fragrances, or petroleum and mineral oils, so it is very safe to use on the skin. It is highly concentrated, so you do not need to use much for each dose. It also contains nourishing ingredients such as aloe vera. This cream is all natural with no animal by-products or harmful parabens that could counteract the benefits of using progesterone. The bottle comes with a pump, and the cream is designed for quick absorption to make application easy and convenient. The cream also comes with a free book on the science behind natural hormone products to help you better understand how they work. The cream works very quickly and effectively. Absorbs into the body quickly and works effectively. 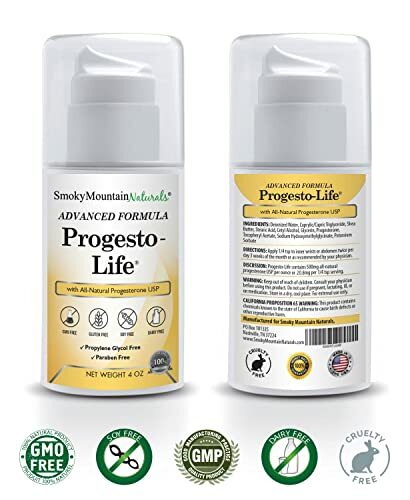 While we love all of the progesterone creams on this list for their natural solutions to hormonal problems, we highly recommend Progesto-Life by Smokey Mountain Naturals because of its very effective formula. How about your choice?